On February, 2nd, 2006, The Press Office at the University of Leeds released an account of my first article on recollective confabulation. It was an accidental stroke of genius. Thanks to it being Groundhog Day, the world’s press had even more of an excuse to print an account of the ‘world’s first study’ of a case of pathological déjà vu, or what many described as a real life Groundhog Day. This was a reference to the great Harold Ramis film, where Bill Murray plays a character stuck in a time loop living the same day over and over. 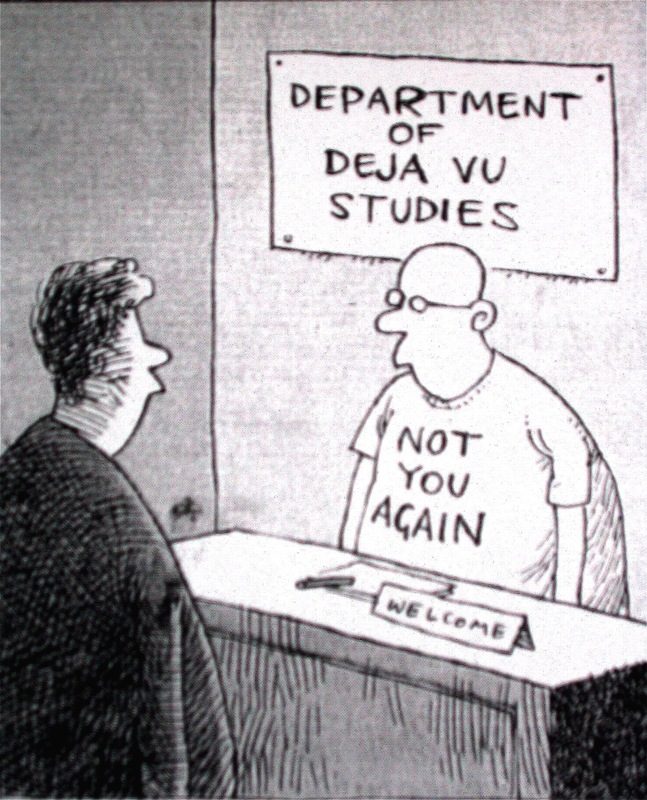 It was a wave of press interest in my work on déjà vu that would culminate in a New York Times feature, and a slot on BBC Radio Four’s PM programme: a piece about déjà vu that was played twice. For a time, I was The University’s most bankable boffin, and I was even let off some of my teaching duties to have time to conduct interviews in a hectic week. The interest in my research work died as suddenly as it came to life, only for this cycle to be repeated every few years. Ever since, my research in recollective confabulation has had something of an ongoing symbiosis with press coverage. My work has been sustained by the oxygen of press interest. Each new case reported in the news leads to another ten or so people contacting me to describe their own situation. Each of which is equally striking, subtly different, and always as sad as it is bewildering. I have been amazed by the ability of the press to recreate – over and over again – interest in the same topic, always finding a novel angle for the same basic story: déjà vu gone wrong, lives lived in a loop, what we can understand about ‘healthy’ déjà vu from studying such chronic cases of déjà vu. AKP was my first case of recollective confabulation. He was a patient at a Memory Clinic in Bath who I saw regularly until leaving the South West for my first lectureship in Leeds. After three years in Leeds, and not the most easy of deliveries, I finally found time to publish his case – amalgamated with one other woman with very similar symptoms – in 2005. The drafting of the paper was helped massively by Martin Conway, who saw a great theoretical value in the case, and suggested I describe this chronic pathological déjà vu as déjà vécu. This is a term which has stuck, but I mostly wish it hadn’t, for reasons I will come to. AKP had a very mild memory problem. He was a retired engineer of high intelligence who was referred to the memory clinic with feelings of déjà vu. At the time, I was working as a research fellow, used to working with people with dementia, and an expert on the varieties of forgetfulness. Every now and then a case would test my knowledge, and I would refer to the Handbook of Memory Disorders, phone some old friends, or book in some time on the one computer in the unit which was connected to the internet. But for déjà vu, there was very little to go on, apart from a description of its frequency in temporal lobe epilepsy. This patient seemed very different from anything I could read about. This is a clip I show to my class in my lectures on memory: it sums up one of the functions of the memory system; to encode and appreciate novelty. So much of what is rewarding and exciting in the world is about novelty. Ever since Groundhog Day 2006, I have had a constant trickle of people – mostly sons and daughters and husbands and wives – contact me about their ‘textbook’ cases of déjà vécu. It is difficult to describe how this makes me feel. For the most part it is a humbling and sad experience, because you realize that are many people with the same ‘rare’ problem, and all of them are seeking an explanation and some help. I am often far away, and able to understand, but not necessarily able to help. Research progress is slow when cases are so far and few between. With AKP I devoted a good slice of my time, and many visits to make the inroads that we had into his condition. It required a great commitment and willingness on his and his wife’s part to do as much testing and talking as we did. And it came at a time in my career when I could devote time to such cases. The first few people who contacted me, saying that they’d read about my cases, though, were somehow amazing, and if I am very honest, almost reassuring. It was striking to have other people who identified with the case report. They too, were reassured. Somebody was taking this problem seriously. If nothing else, somebody knew what this was, and had put a name to it. We settled on the name déjà vécu because we thought that the problem stemmed from recollection and not mere familiarity (which is disturbed in healthy déjà vu) and we wanted to differentiate this pathological form from the more common or garden type. It seemed reasonable to use a term linked to déjà vu: we now know that most medics and carers spontaneously describe their problems using this phrase. But this is nothing like déjà vu. It is much more like Groundhog Day. It is life repeating, not a brief moment of confusion which is spontaneously resolved after a few seconds. Our original terminology is confusing, and even people I have published with, fail to see what the critical issue is with the déjà vécu term. Can healthy people, for instance have déjà vécu? As such, more recently, we use Recollective Confabulation to describe these patients. The recollective part refers to the constant ‘remembering’ of prior events, as opposed to just finding familiar. The confabulation part refers to a tendency to generate supporting ‘proof’ for the feeling of repetition, which is an ever present feature of the cases I have worked with. Confabulation refers to ‘honest lying’, and in a more general form, it is seen in memory disorders fairly regularly. It is a situation where people unknowingly invent memories and events which they then report as if they are true recollections. People are not aware that they are doing this. Our patients had a sort of provoked confabulation for each passing moment, since they usually justify their feelings of repetition by referring to a non-existent moment in the past which corroborates their story. For instance, when her husband found a pound coin in the street, one patient claimed she he put it there for him to find. AKP claimed he had got up, secretly, in time to read the newspaper as it was being unloaded at the newsagent’s that morning. Only that could explain how he had already read it when it arrived. For this insight, inventing information from the present moment in a confabulation of a past event, we have to thank an interview with the BBC. As journalists can often do, a very insightful and direct question elegantly demonstrated the underlying psychology of the situation. The question, ‘I suppose you’ve been interviewed by me before?’ provoked AKP into justifying his present moment: he had been interviewed on the radio before because everything then was as it is now. His description of the present moment was also a reduplication of a confabulated past. As we were able to work with further cases, we noticed the role of novelty in recollective confabulation. People with the problem were most likely to have it for first time experience,a holidays, and television. In short, ironically, it was novelty that was triggering the feeling of repetition. One woman in Scotland, for instance, who had called a TV repairman to fix the constant repeats on her television, and who had also written to the BBC about the repeats, would happily watch old films she knew she had already seen. However, if she tried to watch anything new she was left with tears of frustration as the programme unfolded, and appeared to be just another repetition. Now, the main advice we give carers is to manage or avoid novelty. Patients can do homework on a new location, for instance, learning about it in advance from pictures and descriptions, and this will reduce the feeling of repetition for something that is novel. It’s a long way from being a cure, and I constantly feel frustrated by how little – for now – we have been able to help. I am at pains to stress how these patients’ problems are not actually déjà vu. When you and I have déjà vu, we are aware of a conflict in our memory system. It feels like we have been to a place before, but we know we haven’t. For recollective confabulation, there is little or no ability to ‘know’ that one is mistaken, and so it is very unlike healthy déjà vu. Whilst not being déjà vu, this work on recollective confabulation did inspire me to know more about déjà vu, and again, I have done this in the context of research with case studies. I have also began to research deja vu in epilepsy. Immediately after the first wave of newspaper articles, TV documentaries and radio pieces, a different type of patient started contacting me themselves, as well as the carers and family members of people with recollective confabulation. These cases were striking, because they contacted me aging that they themselves had what I had been describing in the media: permanent déjà vu. This has turned out to be an even more perplexing and rare problem. For now, it seems like these people really do have déjà vu like you and I would have it, but they are life constantly fighting with the feeling that their life is in a time loop, and that their memory system is playing tricks upon them. If they describe their life as a film, it is much less Groundhog Day, but more like Donnie Darko. They feel stuck in a terrifying recursive loop. These people are greatly distressed by the feelings of repetition, and struggle to continue in daily life, even through they are aware if the déjà vu and the fact that it is an erroneous sensation. But it is draining on their mental resources, and in more than one case there has been the temptation to find a ‘reason’ for the déjà vu with parapsychological explanations. In this vein, a smaller minority contact me saying they have this same problem, but treat it as a gift not a disorder. We have now published a case of an otherwise healthy young man with exactly this kind of pathological déjà vu. We think that it is related to an anxiety disorder, and perhaps the feelings of déjà vu trigger feelings of anxiety which itself causes a feedback loop aggravating the feeling of familiarity. We need to know more. We called it psychogenic déjà vu, as we think there is not an organic, brain based caused, as there would be in epilepsy, for example. The work I have carried out on real life Groundhog Days seems as much as a coincidence as the date the original press release was sent out. I have become something of an accidental expert on déjà vu. I have no research programme as such, taking my work one case at a time – the aim is to meet and test people’s memory. I remain indebted to those who contact me to share their experiences, and feel frustrated I cannot do more to help. At least I see the value of research in validating and classifying people’s experiences, especially when many people contact me to say that medical professionals have not taken their condition seriously, or have not known what to make of it. For most of us, after all, déjà vu is charming glitch which exposes workings of the memory system. For those with psychogenic déjà vu or recollective confabulation, these Groundhog Days are very real and very distressing.